Funded by Clarion Futures, we will provide free support, advice and practical tips to help you use the internet safely. With so many services now being delivered online, from booking Doctors appointments to renewing library books, and with the plans to make welfare benefits applications online, it can be scary if you’re not used to online applications. For more details see the Get Online flier. We’re here to take the worry out of it for you. We can talk through what you need to do, either face to face, on the phone or via email. 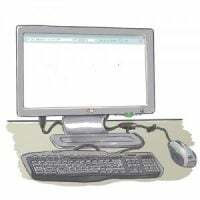 At our Drop-In sessions, we can give you practical demonstrations of how the internet works. We will also be offering accessible training sessions on things like using the internet and social media safely.